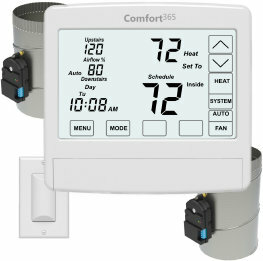 The Comfort365 Touch Programmable Thermostat with Airflow Control works the same as any programmable thermostat by controlling heating and cooling calls but also automatically or manually directs more airflow to the upstairs during the cooling season and more airflow to the downstairs during the heating season so that the upstairs and downstairs are cooled or heated at the same rate. The thermostat is installed downstairs using the existing wiring to the system. A temperature sensor is installed upstairs and dampers are installed to control the airflow to the upstairs and downstairs. The thermostat monitors the upstairs and downstairs temperatures during calls and adjusts the damper positions and airflow as required to provide uniform heating and cooling. NO ZONING SYSTEM REQUIRED. The ProR series for RNC is an economical and powerful 2 or 3 zone panel for gas/electric, conventional heat pumps and dual fuel heat pumps with 2 stages of heating and 1 stage cooling or 1 stage heating and 2 stages of cooling. Compatible with any heat 24VAC, battery powered or power sharing thermostat. Finding a fresh air controller that meets the requirements of ASHRAE 62.2 and Title24 while minimizing the discomfort that can occur when bringing fresh air into a home in severe weather. The Fresh Air Controller, FACM, monitors heating, cooling and ventilation calls and tries to fulfil fresh air minutes of operation during calls to minimize consumer discomfort. The number of minutes for each hour is set with time control on the board. 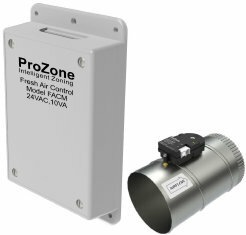 An outdoor temperature sensor can be used to limit fresh air operation in severe weather. 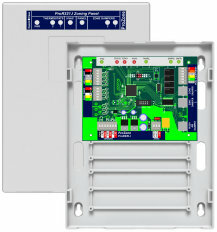 Available with plug and play damper or wired power open/close damper.